If you are the go-to person for family and friends to plan their Walt Disney World Resort vacation, the question of whether it is better to stay onsite versus at an offsite hotel comes up quite often. To be candid, I always recommend staying onsite if possible. So when my husband had a conference at a very large hotel just outside of Disney World in August with free accommodations, I thought what a great way to see if my advice is on target! So here are some of my thoughts. Perhaps it may help you make up your mind about this on-going question- is it better to stay onsite at Walt Disney World Resort or somewhere else? #1 – Transportation- Magical Express Wins! 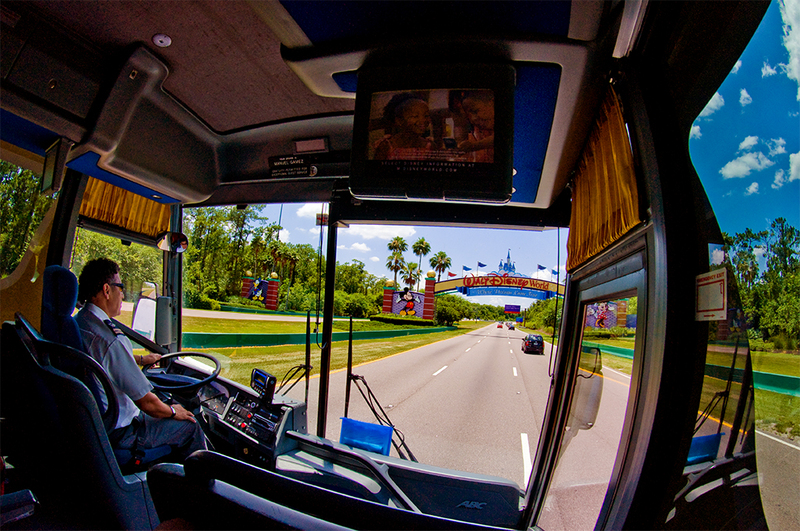 #2 – Accommodations- Disney Magic Wins! So you arrive at your hotel ready to experience some Disney magic and forget all about that wasted time at the airport! Except, you are staying offsite- and there is no Disney magic to be found. In fact, if you are like us, you arrived in your room to the smell of mold and sound of traffic. (For the record, this was an upscale time share property, not a generic motel. In case you were wondering.) After a few phone calls, some serious groveling and two hours later, we got our room moved to a quieter and newer building with no mold. All I could think is that “this would not happen at Disney.” In fact, whenever I have checked into a Disney room, even one in need of an update, the over-all quality and the customer service has always exceeded my expectations. And speaking of the Disney magic, it is a very real thing to consider. When you arrive on the grounds of a Disney resort you know you are somewhere special. From the grounds, to the themed décor, to the hidden Mickey’s and the outstanding staff, everything is as it should be. These are the often overlooked things that truly make a vacation at Walt Disney World Resort more special than most other vacation destinations. Also, during your stay you will feel surrounded by the Disney experience, whereas staying off-site you will leave it behind every time you exit a park. Now that you have made it to your hotel and your semi-quiet room, you need to figure out how to make rope drop the following day at Magic Kingdom. Some hotels have shuttles, most charge a fee. If you rented a car like we did, you can dig out that GPS and drive yourself, but know that you will pay $17 per day to park a standard vehicle at any Disney World park. (I should note that that if you park hop that fee is good for the entire day, you won’t have to pay again.) One thing I would like to mention about my rental car experience and parking is that Disney makes the process really easy. Signs are clearly posted and there was plenty of parking with easily accessible shuttles to drop you off close to the entrance. My only issue with the experience besides paying to park was that I lost the rental car 3 days out of 5 when exiting the park. How does this happen do you ask? Well, we ended up with a gray Toyota RAV4. Apparently many rental car companies use basic colors and popular car models, this does not make it easy to find in a sea of what seems like thousands of cars at the end of a very long hot day at Disney. (I will say my husband did not have this problem when he joined us later in the trip, so take that experience with a grain of salt.) However, compare this experience to Disney’s transportation system. Even if you have to make a few stops before you reach your hotel via the bus, it is better than standing out in the pouring rain searching for your generic colored rental car. I assure you. #4. Cost Savings- It’s a Toss Up. Now that you have read some of my experiences, you are still thinking about dollar signs. As in, yes you believe Disney magic is real, Magical Express does make things easier and it sure would be nice to hop on a monorail at the end of a long Disney day. But, those things come with a price and you are not willing to pay it. Well, in our case having free accommodations did offset the annoyances we endured, but barely. And the fact is, most people are not comparing free accommodations, they are comparing the cost of a Disney World package to an actual hotel, rental car, gas, parking, cost of tickets, meals, etc. And I get it. Although I can’t offer a cost analysis for every scenario I will give you my thoughts on why I don’t always believe it’s a cost saver to stay offsite. First, Disney runs some great promotions which not only include the cost of tickets, but sometimes even include free dining. When they are not running a promotion there are still awesome value resorts to check out whose cost per night will beat out most other hotels in the area hands down. In addition, my friends at the DVC Rental Store are experts at helping you manage a budget while finding amazing Disney Vacation Club members willing to rent their points to you. (I have done that in the past and it was an amazing value for a family of 5 to have three separate sleeping areas and a full kitchen at the Boardwalk Villas.) Having a full kitchen means saving on meals in the parks since we ordered our groceries and had them delivered on the day of arrival. We enjoyed breakfast in our room every day and even packed a few snacks and lunches here and there. For a group of 5, that was a tremendous savings in itself. There you have it. I think it is pretty clear that by comparing my offsite experience with my many onsite experiences, I will stick to my advice. Stay onsite. And if you want to compare a cost analysis to see if indeed you find tremendous savings offsite, contact the DVC Rental Store, they would be more than happy to help you, tell them I sent you!